3D: A Dimension Too Many? Put down your popcorn and step away from the pick ‘n’ mix: we are in the midst of a cinema revolution. For years now, film-fans have been happily enjoying the motion picture experience in a measly two dimensions, and now, here we are, in the Golden Age of 3D, and you’d have to have been living under a pretty big rock to have missed it. Maybe you were at the counter when it happened, wondering where that extra two pounds on your ticket price came from, or standing on Sauchiehall Street, watching posters on the bus pass by as they announce a renewed plethora of Disney ‘3D re-releases’. 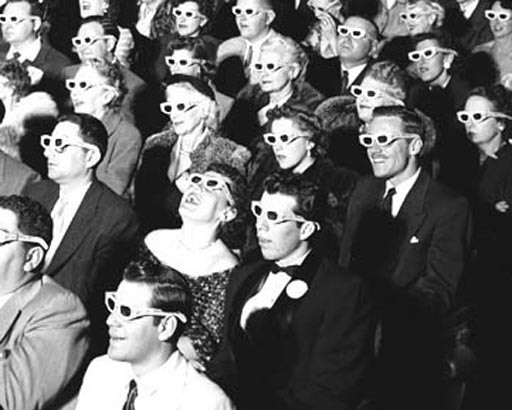 Either way, you will have noticed that 3D cinema is now firmly established in the film listings. Throughout 2011, a new 3D production will be released on an average weekly basis. Films in 3D so far this year have included The Smurfs, Justin Bieber: Never Say Never, Thor and more recently, The Adventures of Tintin, The Lion King and The Three Musketeers. At the higher end of the film classification scale, horrors such as Final Destination 5 and Fright Night have also contributed to the 3D boom of the year so far. This is only a glimpse of an exhaustive list. Presumably, at the start of this list is Avatar. That is not to say that James Cameron’s blockbuster was the first 3D film when it premiered in 2009, or necessarily that it was received well by every film critic. But the amount of work and money put into the film was astonishing – it was fifteen years in the making and cost anywhere between $230 and $500 million (exact figures were never confirmed). Additionally, it pioneered a revolutionary form of ‘4D’ viewing, suggesting that Cameron has apparently uncovered a new dimension that has yet to be discovered by science. With a sequel in the pipeline for 2014, Avatar is set to become a cinema institution. Although few could deny that the film was impressive to watch, with stunning visuals and a blockbuster feel that translated well onto the big screen, Avatar was not without its critics. Many left the cinema thinking, ‘Wait… wasn’t that just Pocahontas with blue people?’- the plot-line did not share the same ground-breaking qualities as the technology behind it. Next, the Hollywood powers-that-be thought to take a safe bet with the eternally beloved Lion King, which was re-released last month; the king has returned, and this time in a whole new dimension. Amid widespread criticism of 3D’s contribution to the film-going experience, The Lion King’s director Rob Minkoff believes that his Disney colleagues’ re-release is an Avatar-like exception to flout these concerns. He admitted in a recent interview with Movie Muser blog that 3D, when not done right, can be disappointing. However, when browsing the latest box office figures, it is hard to believe that he would even care. The Lion King made nearly $900 million at the box office when it was first released in 1994, making it Disney’s most successful film and the highest grossing animated feature film of all time, and it’s re-release went straight to number one in America in its opening weekend. No one could deny that the opening Circle of Life sequence and the tragedy of Mufasa’s death are emotionally charged scenes – but it won’t be the added dimension of Simba and co that has kids leaving the cinema grinning from ear to ear. Amid this 3D boom, BBC film critic Mark Kermode has waged “the 2D fight back”. Perhaps 3D’s noisiest critic, he claims that the new technology is “phoney-baloney gimmickry” and that 3D glasses result in a 30% colour loss. On YouTube, you will find his short film ‘How to enjoy a 3D movie’ with over 25,000 hits. It is a short presentation by Kermode, showing the anti-3D masses how to alter their glasses to reverse the effects of 3D (replace the left lens with a second right one, or vice versa, so that both are the same). Matt Bochenski of British film magazine Little White Lies is with Kermode on this one. He sums up the anti-3D sentiment perfectly: film-makers are trying “to poke us in the eye rather than pierce us in the heart”. Love it or loathe it, or indeed remain indifferent, 3D has well and truly found its way into today’s cinema listings. It seems the 3D naysayers have resorted to merely tolerating the technology, standing up against a genre of film that rakes in million of box office dollars every week. While Cameron keeps busy working on the next Avatar, Disney consider the next step. The original Lion King producer, Don Hahn, was recently quoted saying that Disney has been considering 3D technology since The Princess and the Frog back in 2009. He gushed that Peter Pan would be his favourite Disney film to see in 3D, and admitted that work had already been done on Beauty and the Beast, while Aladdin is also being considered. Until those make it to the cinema, hakuna matata, and hang on to your specs. Posted in Arts and tagged 3D, film. Bookmark the permalink.